I love magazines. So much, in fact, that a couple of years ago I had to put a stop to the insane amount of subscriptions I had. The clutter was too much and I rarely had time to read them all. I narrowed my subscriptions down to two — Whole Living (which is fabulous) and Bon Appetite. I, also, am the lucky recipient of two freebies each month. I cancelled my subscription to Shape last year because I finally had a come to Jesus with myself and decided that I was never going to put that much effort into getting fit. I guess Jesus saw it differently, because I still receive each month’s edition right on schedule. About four years ago, Black Enterprise also started to magically appear in my mailbox every month. I have actually come to love this magazine and, if it ever ceases to appear in my mailbox, I will probably become a legitimate subscriber. Even though I feel like I have my magazine addiction in check, the few subscriptions (and freebies) I do receive still add up. That is why I was so excited to read about a need for gently used magazines in the Presbyterian Hospital’s volunteer newsletter. 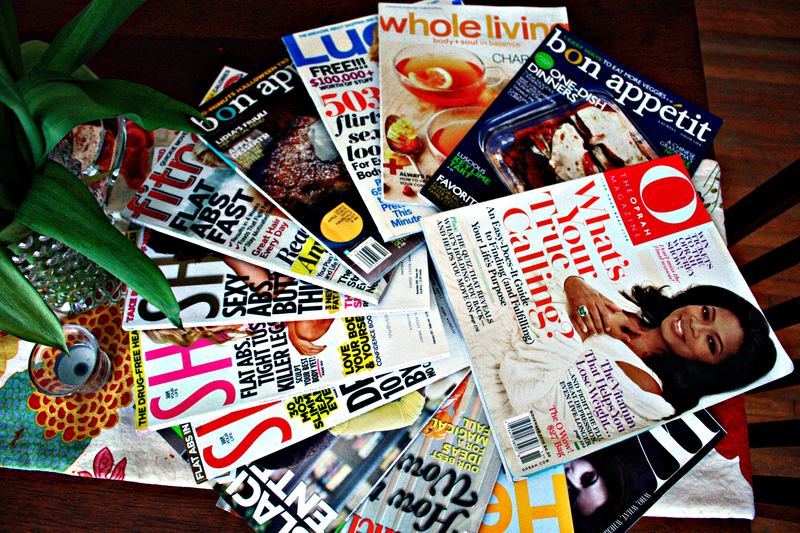 Apparently, they rely on volunteers to donate current and semi-current magazines to place in all of the waiting rooms. I immediately went to my magazine stash and began to sort out the ones less than six months old. After cutting out my name and mailing address on all of the covers (after all, crazy people get sick , too, and I would prefer they not know where I live), I packed up the magazines and off to the hospital they went.